Nurse Landreth is in need of the following clothing items:Boys: x-small, small and medium pants and underwearGirsl: x-small, small, and large leggings/pantschildren's socksThank you!! Butler County School Board Council Special Education CooperativeRole Model Policy For Early Childhood Classes 2019-2020 School YearClick the Link Below to Access the Policy.Click Here! The USD 205 BOE meeting on Monday, December 10 will begin at 8:00 PM at the district office board room. Natalie Bevan, Torrance Lovesee, and Addy Emmons made All-League TVL this year. Congratulations on a great year girls. Congratulations to Hunter Clift and Nic Laidler for being selected to All-League Honors. Hunter was also selected All-State FB. Great job men. 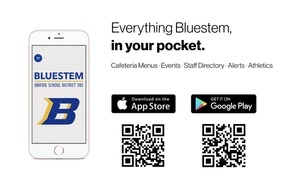 CHECK OUR NEW APP TODAY! CHECK OUT THE APP INTRO VIDEO! Bluestem Elementary Ag Program Raffle! Bluestem Elementary Ag Program is selling $20 raffle tickets for a 1/2 of beef, processing is included. All proceeds benefit the Ag in the Classroom.